The Monterey Bay Aquarium first introduced visitors to the mystery and wonder of the open ocean on a grand scale with the debut of the Outer Bay galleries in 1996. Fifteen years later the aquarium promises to awe visitors again with the mystique of the vast blue world that is seemingly the last true wild place on Earth. In July 2011 the aquarium will unveil its newly remodeled galleries, transporting visitors into the fascinating open sea. 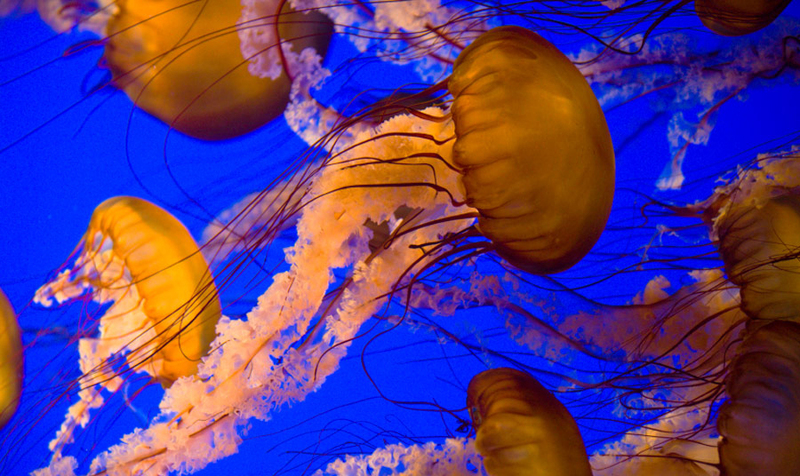 Signature exhibits include the million-gallon Open Sea exhibit and the mesmerizing jellies. But visitors will also find exciting changes in the 12,643 square-foot galleries, including a re-envisioned Ocean Travelers gallery housing some of the ocean’s most impressive long distance swimmers, including young sea turtles and diving seabirds, like ornate tufted puffins. Here, visitors can learn about the threats seabirds, sea turtles, marine mammals and some sharks and fishes face on their long journeys and how we can ensure their safe passage. Highlights include a new interactive multimedia wall devoted to plankton, which form the base of the food web in the oceans, and a large gallery devoted to ocean travelers where innovative environmental art installations and artists’ stories are paired alongside live exhibits. The galleries represents the first time the aquarium has displayed both artwork and live species together in a permanent exhibit. The Ocean Travelers gallery features artists passionate about using their art to inspire viewers to care about the threats facing the oceans and marine life. Each installation celebrates not only sea life but the human connection with nature. Live species new to the aquarium include sandbar sharks, deep-sea jellies and tufted puffins. Book your Monterey Bay Aquarium Package at the Victorian Inn today!